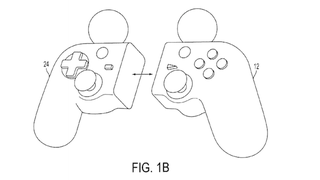 The patent application (dug up by TheSixthAxis) shows that, while the idea for the "Hybrid Separable Motion Controller" is some kind of bold, the execution is mostly what you'd expect. It's just two Move-orbs jammed on top of a slightly more rectangular Sixaxis. Each half of this bad boy is also stuffed with an accelerometer, gyroscope, magnetometer, vibration capability, and (ooh!) a speaker.